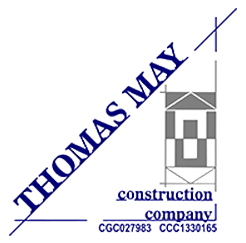 Thomas May Construction Company was founded in 1985 by Thomas A. May, and has been in continuous operation ever since. Since its formation, the company has grown to become one of the larger general contractors in Northeast Florida. Thomas May Construction employs approximately 50 individuals. On July 1, 1989, our company moved into its new, larger location on College Drive in Orange Park, Florida. In 1991, Thomas May Construction took on its first project in the US Virgin Islands, working with the US Army Corps of Engineers, the Virgin Islands Housing Authority, Virgin Islands Government, and the Marriott International/Ritz Carlton. On November 1, 1995, the company expanded its office facilities to accommodate our growing operations. Over our years in the industry, we have acquired experience in many facets of the construction business, such as concrete work, carpentry, construction of metal buildings, and aluminum walkway cover systems.